Are the stores yelling at you to buy new decorations for the holidays? You have plenty and are probably attached to those beautiful, albeit, well-worn ornaments and decorations. How can you discard these treasures when they have so many memories and such joy to still give??? I have an idea that will give some new life to some old and trusted friends. I have a floral spray on my door that is probably 7 or 8 years old. It is plastic, has a lot of missing pieces and very tattered - BUT, I love it and when I am spray painting something else, I give it a light spray. 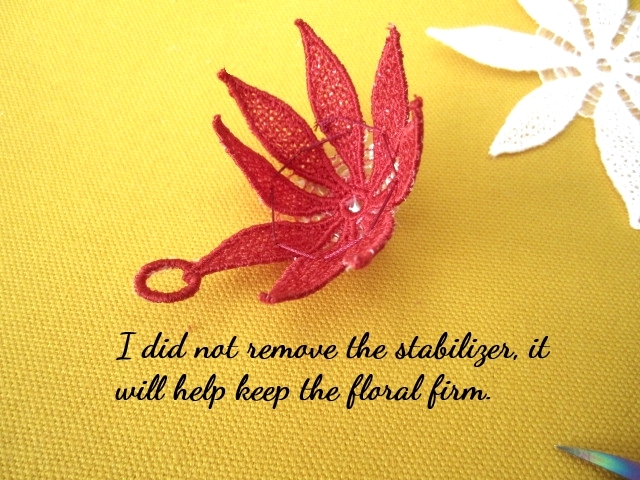 I remove whatever is really in poor shape and add some new silk or plastic flowers. How easy is that? I can do that with my Christmas decorations, but, I decided on something different. 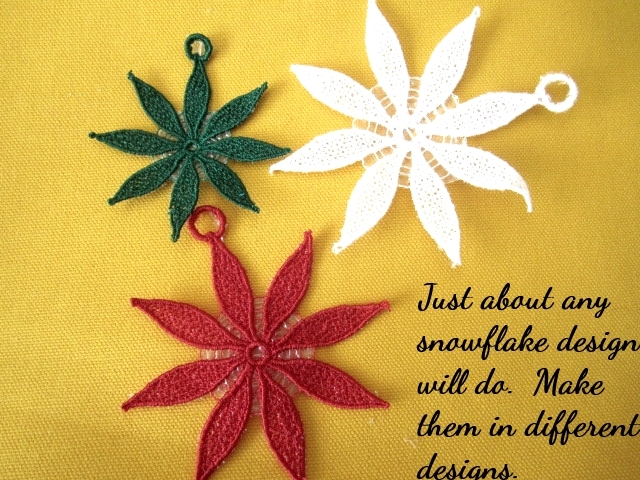 I wanted to make free standing lace snowflakes - but not the usual ones. 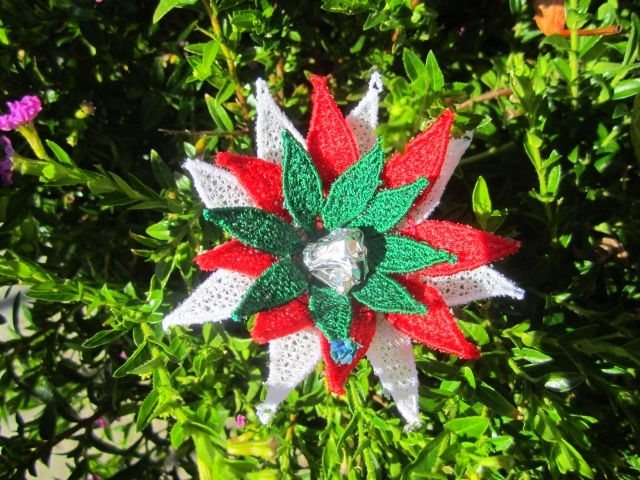 I am going to break one big rule and create my own version of a floralette-snowflake-ornament - maybe I will call it a FSO. . . 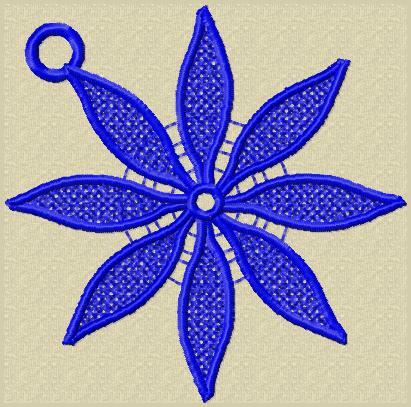 I must own 200 snowflake fsl because when I started to embroider, I was in awe of fsl. But I outgrew that. 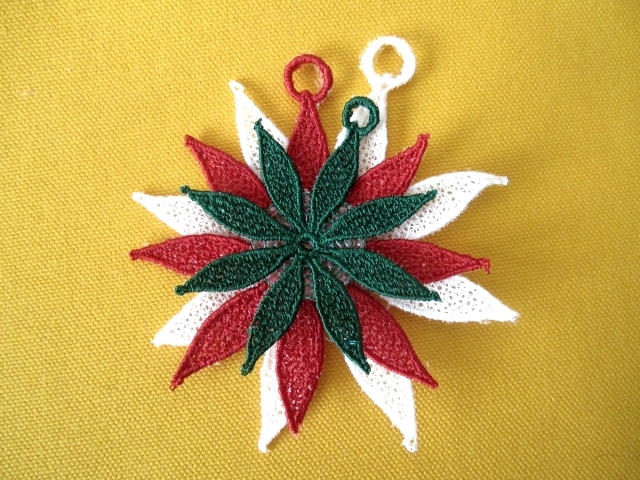 In my stash of designs, I found a design that is simple and low in stitches. 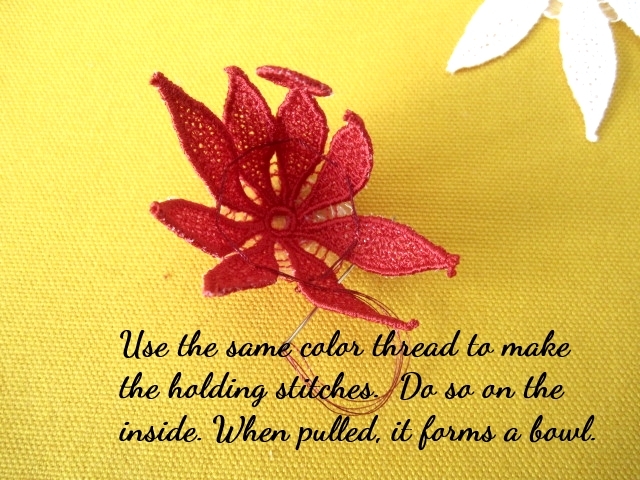 That second part is important to me, I like the fewest stitches available to create my projects. I used my software to adjust this design. Fsl designs usually warn not to adjust the size. The likely reason is that stitching is (just about) laid down individually. Getting the underlay and the design to hold up by themselves is not a beginning digitizers project. You need to consider the weight - not too light - not to heavy! (I have several that are too light weight and unusable.) You will place the loop for hanging where the end result must be (not every design will hang vertically.) pleasing to the eye. Etc., it is not easy. I am a little bit of a rebel rouser and I decreased the original design by 20%. I needed to make sure that the change would not create issues. I did my 'discovery stitch' to check for feasibility and it worked!! Then, I needed to make another size adjustment and that was more daunting. I needed to decide to use the 96mm x 98mm (4" by 4") or the 84mm x 82mm (3-1/4" x 3-1/4") and create another decrease. After using the smaller one successfully, I used it to reduce to another 20%. I sewed them out (if you need info on free standing lace - look here) and these are the steps for the creation of this project. I revisited that blog, and it is one of my favorites, I hope it is for you too. Check out some of the fun ideas here at AnnTheGran where you learn and find new ideas. Join in the conversation, your thoughts are important to all of us at AnnTheGran. 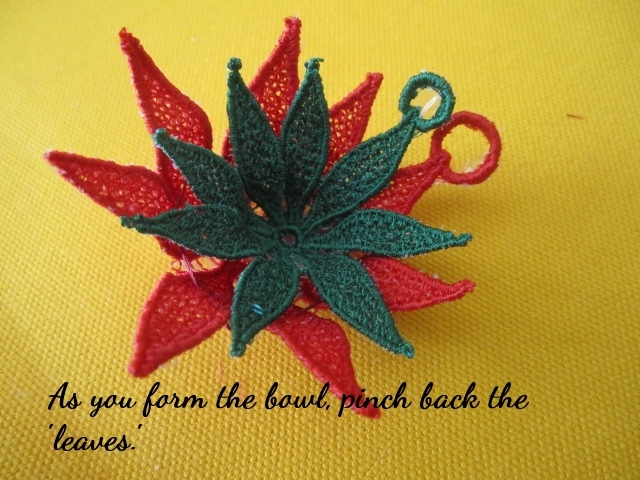 I was noticing that Debbie, Sewblest, has a wonderful idea about bling in her latest blog. (Does that make it a 'bling-blog'???) I think some bling on the petals would be very nice too! A couple of years ago, I did a blog on Candlewicking for Christmas, check it out. and it never has 8 points. but not snow flake or ice crystal. some reason, I can get my head around larger problems. Actually, I do recall that, now that you mention it. I had forgotten that lesson. I keep telling people that my brain is full and that is why I forget things!! Since the objective is to add a 'flower like' design to places that need a pop of color, or have a place to fill, I will forgive me for my oversight.